Like them on Facebook to get the form. 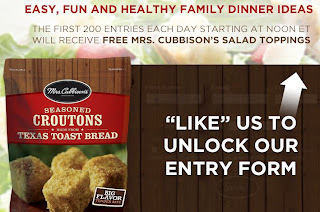 The first 200 everyday will get a free sample of Mrs Cubbison's Salad Toppings. Click the link below to go to Mrs. Cubbison's Facebook page.